For many, the name John Busby is synonymous with acute observations of nature and an enviable ability to capture character, light and movement in just a few simple lines and washes. His work was born from first-hand experience of nature and, as is the case with the very best artists, it encourages fresh ways of thinking and seeing. John Busby was born in Bradford, Yorkshire, on 2nd February 1928, the son of Eric and Margaret Busby. He grew up in Menston, Lower Wharfedale, and from an early age it was clear that his interest lay in art, rather than ‘Busby’s of Bradford’ – the family-run department store. His family were supportive of his interests, however, and after attending Ilkley Grammar School he went on to study at Leeds University and then Edinburgh College of Art. At the end of his studies, which included a postgraduate travelling scholarship, John was offered a post teaching drawing and painting at Edinburgh College of Art in 1956, where he taught until his retirement in 1988. John was a natural teacher, full of enthusiasm, keen to pass on knowledge and with a remarkable ability to motivate and inspire. John was a past president of the Society of Scottish Artists, a member of the Royal Scottish Society of Painters in Watercolour and of the Royal Scottish Academy. He was a founder member of the Society of Wildlife Artists and a key member of the Artists for Nature Foundation. In 2009 he was declared Master Wildlife Artist by the Leigh Yawkey Woodson Art Museum, in Wisconsin, USA. Like many others I first encountered John’s work in the RSPB’s Birds magazine in a series of articles titled ‘How to draw birds’. The concise, richly illustrated articles came as a revelation to many who had attempted to capture on paper the lively spirit of birds, and a much enlarged version of those articles was published in book form in 1986. The ethos of Drawing Birds, which became hugely influential, was drawing from life. Suddenly anatomy was as important as feather detail; indeed, feathers were seldom isolated, instead logically grouped in tracts and the shapes those feather masses formed were skillfully rendered by a quick line or wash. The importance of understanding anatomy was again stressed if a bird’s movement or balance was to be conveyed convincingly. Once the basics were grasped, John would delight in continually adding something new to the mix. In bright sunlight readers were encouraged to record the shadow first, since he insisted that the shadow was likely to change or disappear before the bird! Another chapter dealt with flight – flight was an area where he truly excelled and few artists are able to match the impression of buoyancy and movement that are found in Busby’s flying birds. 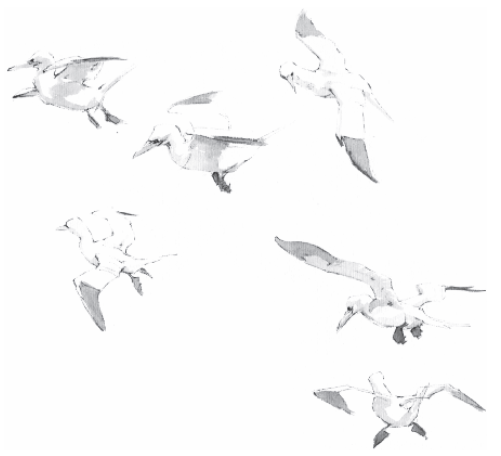 The essence of the bird and a feeling of buoyancy have been captured quickly using minimal lines and washes. The result can appear deceptively effortless, yet this distillation requires great skill and knowledge and reveals the work of a true master. John talked about bird flight with incredible passion and as he spoke it was wonderful to watch him imagining how it must feel being a Gannet hanging in an up draught – subconsciously outstretching his arms and controlling the airflow by adjusting the position of his hands and elbows, even making fine adjustments by using his thumbs as alulas. But there was much more to his art than the more familiar bird work. John was passionate about landscape and many of his larger oil landscapes, frequently seen from a bird’s-eye view, show strong geometry and are at times enshrouded with subtle symbolism. He was also fascinated by the ‘miniature landscapes’ of rock crystals and rock pools – a fine cross section of his work can be found in Land Marks & Sea Wings, published in 2005. He illustrated over 30 books including Birds in Mallorca (1988) and Nature Drawings (1993). Seabirds, including of course his beloved Northern Gannet Morus bassanus, were a great love of John’s. Some of my favourite examples of his work are the seabird draw- ings he made between the late 1970s and the mid 1990s. 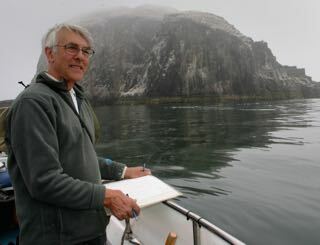 During this period he worked on many projects with seabird biologist Bryan Nelson, who sadly passed away a month after John. The acute observation and exquisite use of line in many the drawings and paintings of this period I find breathtaking; the marriage of art and biology is inspiring. I believe some of the seabird compositions from this period of John’s career to be among the finest examples of bird art ever made. Every year from 1988 John ran a Seabird Drawing Course based on the beautiful coastline and islands of the Firth of Forth. I attended my first course in 1991 as a young, wide-eyed art student and, in common with many participants, the week-long course completely changed forever the way I was to watch, draw and paint nature. This was my first meeting with John and I was instantly struck by his gentle and generous nature and, increasingly as the days progressed, by his great (at times wildly eccentric) sense of humour. John’s good friend, the late David Measures, had just joined as a course leader and the dynamic worked very well resulting in a memorable week of incredible energy and humour. Other young students on that early course who had come under Busby’s spell included Kim Atkinson, David Bennet, Greg Poole and John Walters. Greg would go on to assist John with the course, later to be aided by other great admirers of John’s work – John Threlfall and Darren Woodhead. Of course there were many other facets of John’s life and at his funeral in Musselburgh the readings by his family and friends spoke lovingly of a passionate man with a strong Christian faith and a great love of classical music and song. Indeed this love of music led to John meeting his wife, Joan, an accomplished singer, and they were married in 1959. John was devoted to his family and he and Joan had three children – Philip, Rachel and Sarah – and nine grandchildren.